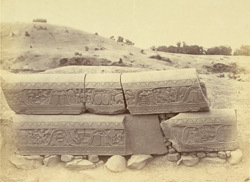 Photograph of some sculpture pieces excavated from the stupa at Bharhut taken by Joseph David Beglar in 1874. In this photograph we can observe some coping from the south-west quadrant of the railing at Bharhut. The exact date that a stupa was first erected at this site is not known, however, by the time the railing was added in the latter half of the second century BC, Bharhut had been established as a Buddhist place of worship for centuries. At this stage, the stupa complex consisted of a hemispherical dome, encircled by an inner and an outer railing or vedika. Evidence from inscriptions shows that the construction of the railing was funded by donors from all over India, therefore Bharhut was known and important to people from a wide geographical area. The railing depicted narratives such as stories from Buddha's life, the purpose of which would have been two fold: firstly to decorate a sacred place and secondly to help the religion appeal to an often illiterate, popular audience. The first scene depicted on the top piece of coping depicts an episode from a narrative known as the Dabba Puppa Jataka and shows a seated Bodhisattva, two otters with the head and the tail of a fish and a jackal who has taken the lion's share of their meal. In the next scene, a king, his minister and the queen are standing before an ascetic seated in his hut in a forest. It is probably an illustration of a story called the Sarabhanga-jataka. Next are three elephants depositing some offerings in front of a sacred bamboo tree. The next scene illustrates a passage from the Secha jataka. A Bodhisattva gives water a thirsty monkey, yet the monkey, instead of thanking his benefactor, started to make faces to frighten him. The bottom coping is decorated with an episode from the Bisa Jataka in which Sakka appears to the Bodhisattva and confesses that he concealed a bundle of the lotus-stalks. The other scenes shown on this piece of coping have not been identified so far.